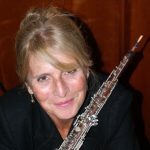 Margaret Helfer Herlehy, oboe, received her formal musical training at the University of Michigan and Sarah Lawrence College where she remained as Artist in Residence for a 5 year tenure. On relocating to New England, she joined the faculties of Phillips Exeter Academy and later, the University of New Hampshire and enjoys working as a freelance artist in the Greater Boston Area. Recent ensemble work includes performances as principal oboist with the Hanover Chamber Orchestra, Symphony New Hampshire, Opera North and as a member of the Tim Janis Ensemble. In 2017, she celebrated her 20th year as Oboe, Oboe D’amore soloist with the White Mountain Bach Festival. Reaching to extend her voice with the oboe, Margaret recently produced and performed Café 1930, a collection of South American music including choros and sambas with UNH classical/jazz guitar teacher David Newsam and Boston based Brazilian Jazz artists. The CD caught the attention of jazz critics who praised her performance as “Powerfully intoxicating”. The CD will be released by PARMA in February 2018. As a performer, arranger and educator, Margaret lives an eclectic musical life on the New Hampshire seacoast. Copyright Classicopia. All rights reserved.